The Lion King stage production runs at the Bristol Hippodrome from Sat 7 Sep–Sat 23 Nov. Tickets are on sale now. Julie Taymor's musical version of the epic Disney animation is celebrating 20 phenomenal years on stage that with a second UK tour. Following a three-month run at Bristol Hippodrome the show moves on to Edinburgh Playhouse for the winter months. Since the UK premiering in 1999, The Lion King has welcomed over 15 million theatergoers and remains the West End's best-selling stage production. It is the sixth longest-running West End musical of all time and continues to sell out performances. It's bagged Tony Awards and Laurence Olivier Awards for Best Costume, Best Choreography, Best Musical and many many. 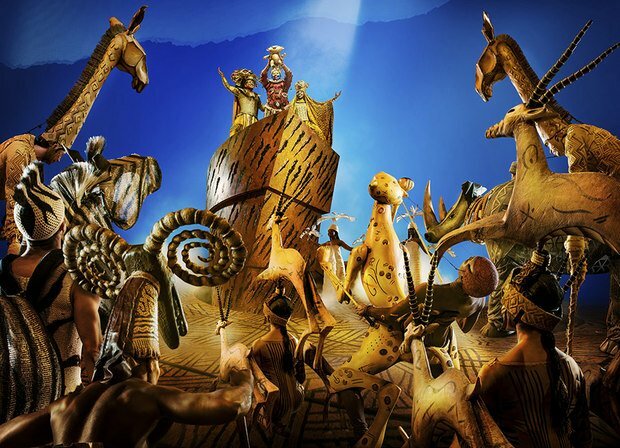 The award-winning stage and set design recreates the majestic Serengeti Plains and the African Jungle to the sounds of Elton John, Tim Rice and Lebo M's award-winning score. Fans can expect chill inducing renditions of hits 'The Circle of Life', 'Can You Feel The Love Tonight', 'Shadow Land' and many more. The Lion King runs at Bristol Hippodrome from Sat 7 Sep–Sat 23 Nov. Tickets are on sale now. It's Hamlet … with lions! Julie Taymor's puppet-powered stage version of Disney's spectacular tale of a dead king and an errant son is a feast of exuberant theatre for the whole family, with show-stopping visual effects, gripping drama and plenty of laughs. Be prepared for a chance of a lifetime. Be prepared for sensational news!